In this article, I have compiled a list of Twitter GIF downloaders to download GIFs from Twitter on Chrome, Android, and iPhone. I have also included some online twitter gif downloaders in this list. After going through the list you will know how to download GIF from Twitter on your phone and PC. Well, most of these tools works in a similar fashion i.e. specify a tweet URL of the GIF to be downloaded and then download the GIF either as a video file or GIF itself. The best part is that the list includes Twitter GIF downloaders for major platforms. 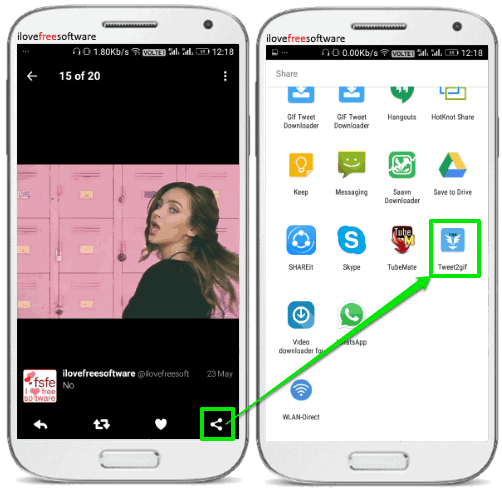 So, whether you want to download twitter gif from PC, or Android phone, or iPhone, you will be able to find a twitter gif downloader in this list that will cater to that. If you want to download videos from Twitter then you should check out these 5 free websites to download Twitter videos. TWDown is a free online website to download Twitter gif and videos. It downloads Twitter GIF as video file. 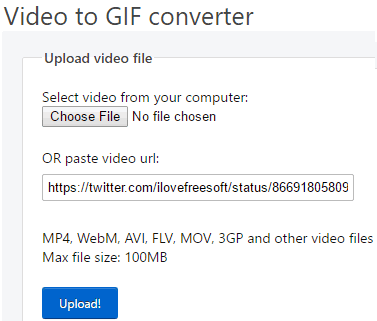 It can fetch the GIF from tweet URL and will convert it to a video file of MP4 format. There is no need to create any account; just go to the link provided above and then paste the tweet URL. After that, click on the “Download” button and you will see the GIF (not played) and the links to download it as MP4 and MP3 file. Click on them to download Twitter GIF as video and save it to your PC. EZGif is another free website that can download twitter gif. Unlike TWDown, it lets you download the gif as animated gif itself. Not only that, it actually lets you edit twitter gif before downloading. You can crop, resize GIFs, skip frames in GIFs, optimize GIFs size, add text to GIFs, etc. 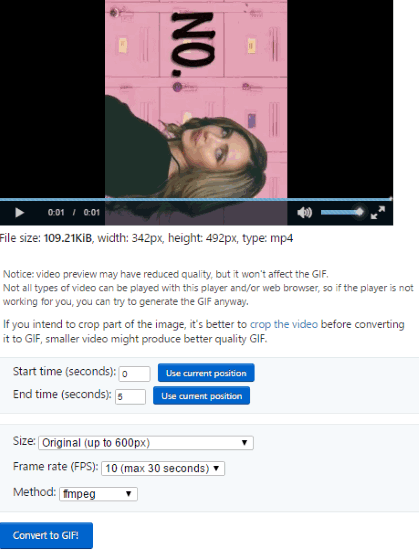 EZGif is actually an online video to gif converter. When you go to this website using the link I mentioned above, you can directly paste the URL of the tweet in “paste video url” box. Then click on “Upload!” button. It will immediately extract the gif from the tweet, and will show that as a video. You can then perform the edits that I mentioned above. For example, if you don’t want to download entire gif, but only a part of the gif, then you can specify start and end time. You can also modify frame rate. Once done, just click on “Convert to gif” button. It will then convert that to gif, and will show the gif on its interface. You again get some options to edit the gif. For example, you can optimize the gif to reduce its size, etc. 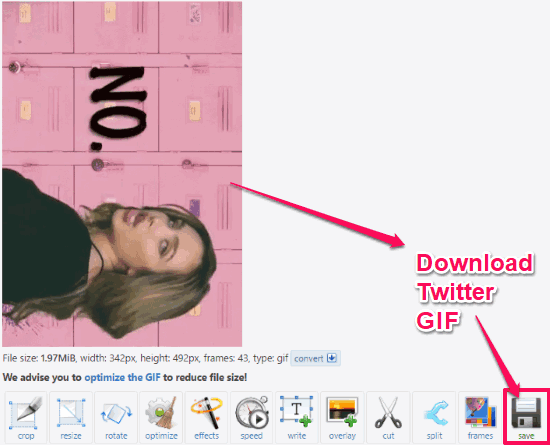 Once done, just click on “Save” button to download twitter gif as animated gif. I really like this website for its ease of use, as well as the options that it provides to edit the gif before downloading. Tweet2Gif is a pretty simple online Twitter GIF downloader website. It lets you download twitter gif as animated gif or a video file. You have to provide to it URL of the tweet from which you want to download gif. It will then extract the GIF from the specified Twitter link. The only drawback is that it automatically uploads the Twitter GIF to Imgur as well. Visit the link provided above and copy the link of the Tweet with a GIF in the URL box. After that, click on the “Create GIF” button. It will then extract the GIF from the specified link. Wait for a few seconds and you will see the extracted GIF on its interface, as shown above. 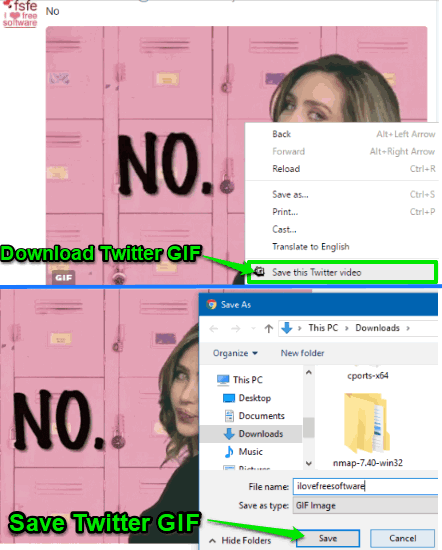 Now, just click on the “Download” button to save the Twitter GIF on your PC. It will also show the imgur URL where you can see the extracted gif. 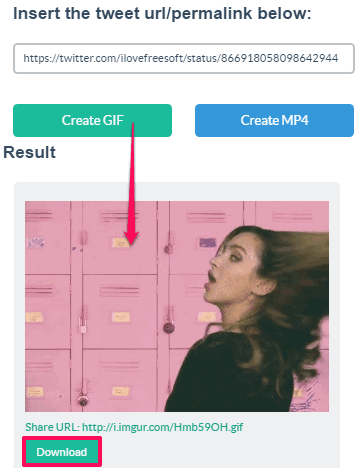 In case you want to download twitter gif as video, then click on “Create MP4” button. If you are a Chrome user and don’t want to use any of the websites to download Twitter GIF, then you can check out free Chrome extension to download twitter gif. Twitter Video Assist is a pretty simple Chrome extension which let you download GIFs from Twitter. It makes the task to download GIFs from Twitter a lot more comfortable as there is no need to copy tweets URL to download GIFs . This Chrome extension directly integrates with the context menu of the browser and give you the option to save Twitter GIFs and videos. You can install it from the link provided above and then open Twitter website. Now, when you come across any GIF on Twitter and want to download it, right-click on the GIF and click on the “Save this Twitter video” option. It will then start the processing and will open a new tab with the GIF you want to save. However, you don’t need to manually save the GIF as it automatically opens up a dialog box to save the GIF file, as shown in the screenshot above. Once the Twitter GIF is saved, the newly opened Chrome tab with Twitter GIF is also automatically closed. You can also use this extension to download a Twitter video by just right-clicking on it. 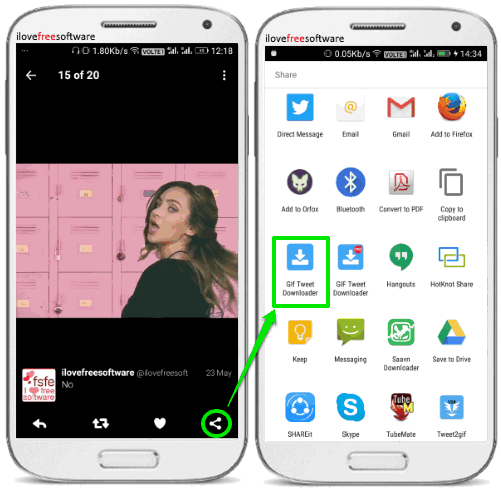 Tweet2gif is an Android app to download Twitter gif. With this app, you can quickly download Twitter GIFs and videos. The best part is that it also lets you specify parameters that makes the GIF downloading process a lot faster. You can specify FPS and reduce the color quality of the output GIF to produce GIFs faster and of smaller sizes. There are 2 methods by which you can download GIFs and videos from Twitter using this Android app. In the first one, you can provide the Tweet URL in the app to download GIF. 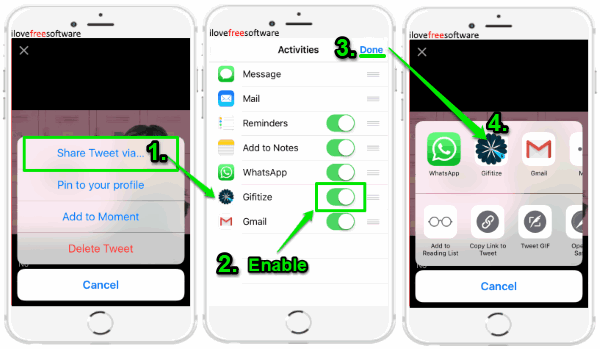 In the second method, you need to have the official Twitter app installed on your phone, as you need to share the GIF from it to the Tweet2gif app. After that, you can use this app to download the GIF and save it on your phone. Method 1: You can copy the link of the tweet with the GIF you want to download from the Twitter mobile website. Open it on any Android browser and then tap on the “small down arrow” right next to any tweet or GIF tweet. This will bring forth some options, you have to choose “Copy link to Tweet” option to copy the Tweet URL to clipboard. Now, open Tweet2gif app and paste the copied tweet URL, as shown in the screenshot below. After that, tap on the “Download GIF” button and the GIF will be downloaded to your phone. The downloaded GIFs are saved in “tweet2gif” folder in the phone storage. This default save folder path can be changed from the app preferences. Method 2: This method is easier as compared to the first one. But, it can only be used when you have the Twitter app installed on your phone. From the Twitter app, you can share a GIF with this Android app and then use this app to download twitter gif on Android. In order to share a GIF from Twitter app, tap on the “Share” button and then share it to “Tweet2gif”, as shown in the screenshot below. This will open the app as shown in the screenshot of Method 1. Tap on the “Download GIF” button and your GIF will be saved on your device. 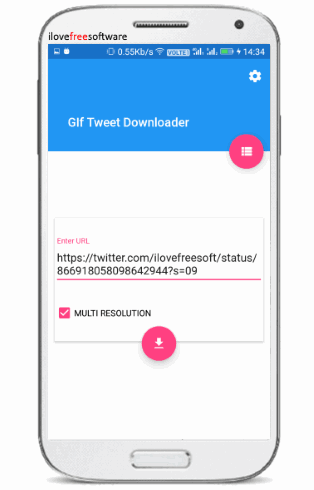 Gif Tweet Downloader is another free Android app to download Twitter GIF as video. It works in the same way as the previous one. Enter tweet URL of GIF and then download it as a video file (MP4). The only limitation of this app is that you can’t download the Twitter GIFs as GIF files. However, the added advantage of using this app is that you can search for any Twitter user to fetch his/her uploaded videos and then download them one by one from the app. Install it from the link provided above and then open it. As I mentioned, you need to specify the tweet URL of the GIF to be downloaded. You can copy the tweet link from the Twitter mobile website as explained in the previous app. After that, open it and paste the copied tweet URL in the “Enter URL” field and then hit the “Download” button. This will download the GIF as video from the specified tweet URL. Do note that it also has a “MULTI RESOLUTION” option but I couldn’t figure out its actual purpose. If you don’t want to copy tweet URL every time you want to download a GIF from Twitter using this app, then you can share that gif with “GIF Tweet Downloader” app, as shown in the screenshot below. This will instantly open the Gif Tweet Downloader, as shown in the screenshot above. Now, you just have to click on the “Download” button to save the Twitter GIF as a MP4 video. Gifitize Lite is a free iPhone Twitter GIF downloader to save GIF from Twitter. It works in the same manner as the Android Twitter GIF downloaders on my list above. However, it doesn’t give you any option to provide a tweet URL to fetch GIF from it. The only way you can download Twitter GIFs using this iPhone app is via the official Twitter iPhone app i.e. share any GIF from the Twitter app to Gifitize. It will then download the shared Twitter GIF to your iPhone. If your iPhone Photos gallery doesn’t support playing GIFs then you can view them within this app or transfer the downloaded GIF files to PC. Open Twitter iPhone app and start browsing your feed or go to a Twitter handle to download a specific GIF file. When you see the GIF on Twitter you want to download, tap on it to view the gif, and then share the tweet via Gifitize. Do note that when you do it for the first time, you will have to enable the “Gifitize” option in the Activities, as shown below. In order to do this, tap on the “More” option when you see a list of apps to which you can share the tweet and then enable the “Gifitize” option. Now, you have to share the tweet to Gifitize, which then saves the shared Tweet GIF on your phone, as shown in the screenshot below. The saved GIF file can then be viewed from the iPhone gallery (if your iOS version supports it) or from the app itself. 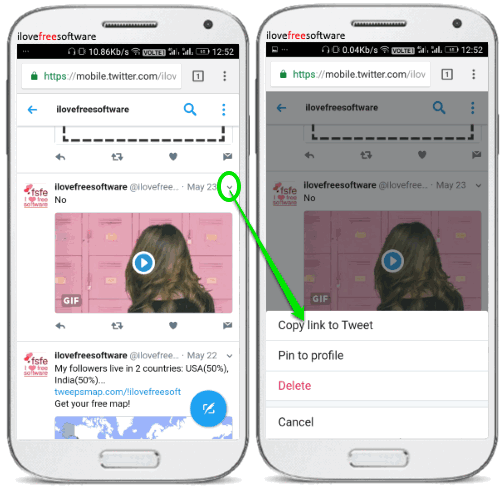 In this article I introduced you to some Twitter GIF downloader websites, Android and iPhone apps, and a Chrome extension. So, if you are a GIF lover and want to collect some funny and cool GIFs from Twitter, then use any of these websites or apps to do so. My favorite website to download Twitter GIFs is EZGif, and favorite Android app is Tweet2gif.